Note: This was a factorial trial; the other intervention under study - pantoprazole vs placebo - will be reported later in a separate report. 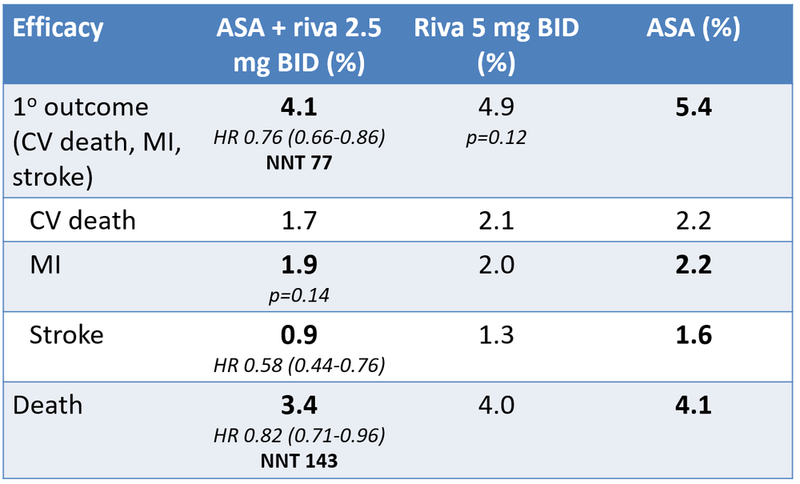 In patients with PAD, rivaroxaban + ASA also reduces the risk of major adverse limb events (NNT 100). Monotherapy with rivaroxaban 5 mg PO BID did not reduce events compared to ASA monotherapy, but increased major & minor bleeds (NNH 112 & 39). Further subgroups suggest that relative risk reduction similar across most subgroups, including those with vs without prior PCI, optimal use of 2o CV prevention vs not, & different risk categories. Notably, however, significant p-value for interaction suggesting no/less benefit in patients with history of CABG.